There are many reasons why mattresses in a box are becoming increasingly popular. For starters, they cost much less than traditional mattresses and are delivered to your door vacuum packed and rolled. Beyond that, many companies offer free shipping and risk free trial periods. Lull, one of the mattress-in-a-box companies, was created to help people sleep better and live better. The company, based in Santa Barbara, California, sells its mattresses exclusively online. If you are looking for a wooden frame with a modern and simple design, you won’t have to look any further than the Lull website. With its slatted base, this frame is durable, flexible, and supportive. The slats keep the mattress cool and dry by providing ventilation. The slats adjust to any type of sleeper, absorb body movement, and make your mattress last longer. Together with the Lull mattress, this frame helps to keep your back aligned for a comfortable night’s sleep. Made from pine wood with steel rail fittings, the Lull platform bed frame is easy to assemble, all-inclusive, and reasonably priced. The frame can be put together in less than five minutes using one tool, an Allen wrench that is provided. 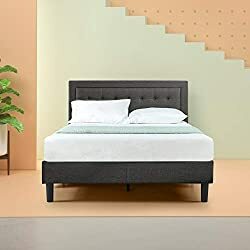 With 6.5 inches of under-bed storage space, a one-year warranty, and free shipping, this bed frame is a great choice for your Lull mattress. If it is a metal frame you prefer, this affordable metal frame by Lull is versatile, simple, and dependable. 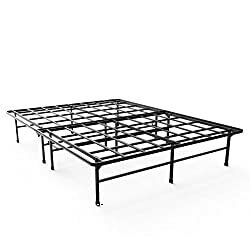 Constructed from solid steel, it provides durable support, 14 inches of under-bed storage space, and holes for attaching a head board and a foot board. The metal grid design supports a variety of mattress types, and you can use it with other bed frames because it fits right inside of them. The Lull metal bed frame is easy to assemble and requires no tools. With its folding design, it is easy to store and takes up little space. With free shipping, a no risk trial period, an easy return policy, and a 5-year warranty, it is hard to go wrong if you purchase this frame and give it a try. What is a Lull Mattress? Lull mattresses use a three-layer technology for support and comfort. The gel-infused top layer is designed to keep you cool by pulling heat away from your body. It uses memory foam to relieve pressure and conform to your body’s shape. The middle layer, made from proprietary foam, provides support, while the core layer, made from polyurethane foam, provides strength and durability. The multiple layers help to absorb movement so you won’t feel it when your partner moves around during the night. The Lull mattress is suitable for all types of sleepers: back, front, or side. Committed to community participation, corporate responsibility, and fair labor practices, the Lull company provides free shipping, a 100-night risk free trial period, excellent customer service, and a 10-year warranty. Returns are cost-free and easy. CeriPUR-US Certified, Lull mattresses meet strict standards for reducing off-gassing and use no harmful chemicals. The Lull mattress company is dedicated to sustainability and is a member of the Sustainable Furnishing Council. Setting up your Lull mattress is easy. You just take it out of the box and put it on a flat surface. Then slowly unwrap the outer plastic and carefully cut the inner plastic. Once opened, the mattress will expand and can be slept on right away. Full expansion can take up to 48 hours. Lull mattresses can be used with almost any type of bed frame including flat platform frames, adjustable frames, slat frames, box springs, or no frame at all. The mattresses come in six sizes: twin, twin XL, full, queen, king, and California king. 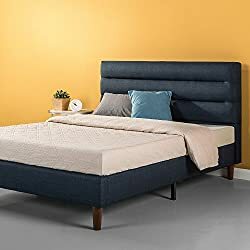 What kind of frames can you use with a Lull mattress? Like most modern one-sided mattresses, Lull mattresses are fine on any flat level hard surface and do not require a box spring. While some mattress companies specify a required foundation for their warranty to be valid, Lull does not. Platform, adjustable, and slatted frames, as long as there is no more than three inches between slats, box springs, or putting your mattress directly on the floor are all fine according to Lull. Since the Lull mattress is compatible with just about any bed frame, you probably won’t need to get a new frame if you already have one. If you don’t already have a bed frame or you are looking for something different, you will have many choices in terms of types, styles, and materials. The most common types of frames used for Lull mattresses are flat platform frames with either a solid base, slats, or lattice. Slats are horizontal planks used to support the mattress and provide ventilation, which will help your mattress last longer. If you choose a platform frame with slats, be sure they are at least two inches wide and no more than three inches apart. Platform frames support the mattress without the need for a box spring. They are usually low profile and may have a head and foot board. Platform frames are economical and come in different sizes and styles to match your mattress and your decor. They have room for storage underneath, look modern and sleek, and provide the support that you need. An adjustable bed frame is also compatible with a Lull mattress. Adjustable beds have a motor that allows you to elevate and adjust the head and foot of your mattress. These are a good choice for people with certain health conditions such as acid reflux, asthma, back problems, or poor circulation. They also are convenient if you like to read or watch television in bed. Box springs, while not necessary to use with a Lull mattress, can add height to your bed. Constructed from wood, wire coils, or grid and covered with fabric, a box spring raises a mattress to make it higher profile. It can also absorb shock, prolonging the life of some mattresses. A foundation is similar to a box spring, but consists of a wooden frame with slats covered in fabric. It also supports a mattress and adds height. The Lull mattress can be used with no frame at all and put directly on the floor. Even with no frame, it will provide the support you need. However, there are some downsides to putting your mattress on the floor such as lack of air ventilation, which can lead to mold and mildew, and difficulty getting in and out of bed due to the low profile. If you put your mattress on the floor, you should be sure to air it out regularly and use a mattress cover. Once you have determined what type of frame you want for your Lull mattress, you can consider the type of material that you want and other features you are looking for. Other factors to take into account are durability, style, ease of assembly, design, and warranty. To get started, you might want to consider one of the Lull mattress frames designed specifically to go with the Lull mattress. If you want to look beyond the bed frames offered by Lull, you will find that there are many affordable choices online or at furniture shops. Whether you prefer a sturdy metal frame, a wood platform frame, a contemporary designed frame, or an upholstered bed frame, you will have many styles to choose from. Whichever one you choose, getting the best mattress and bed frame will help you get a better night’s sleep.